Frequent readers of my "Attempt To Date Series" know that I fail more often than I succeed at my attempts to date words. On a personal note, I am satisfied that I have finally found a word (Jesus) that can be dated to an exact year, but before the answer is shown, we must have some background on the usage of the word "Jesus" throughout the history of the English language. In Old English rendered by hǽlend ‘saviour’ ; but during the Middle English period regularly used in its Old French (objective) form Iesu (Jesu). The (Latin nominative) form Iesus (Jesus) was rare in Middle English, but became the regular English form in 16th cent. Yet in Tyndale's New Testament, 1525–34, the form Iesu was generally used where the Greek has Ἰησοῦ, the Vulgate Iesu, in the vocative and oblique cases. This was, as a rule, retained by Coverdale 1535, and in the Great Bible 1539, also, in the vocative instances, in the Bishops' Bible 1568; but in representing the Greek oblique cases, this has Iesus. Iesu disappeared from the Geneva 1557 (except in one place), and from the Rhemish 1582, and the version of 1611. In Middle English the name was rarely written in full, being usually represented by the abbreviations ihu, and ihc, ihs, ihus, or iħu, etc. : see IHS. These have been commonly expanded by modern editors as Ihesu, Ihesus, forms which occur occasionally in MSS. and in early 16th cent. printed books. From the above statements, we learn  that Jesus was translated into the Old English word for "Savior" (haelend) because Jesus and Joshua means "Savior" in Hebrew,  in the Middle English period the word "Iesu" was rarely written in full and  "Jesus" was usually abbreviated by IHU, IHC, IHS and IHUS. These abbreviations were later erroneously expanded into IHESU and IHESUS. Clearly, the editors in the early 16th century were not aware of the Greek origin of the abbreviations. The following is a chronological list of all examples found in the OED until the year 1800 for healend, Jesus and IHS abbreviations. These are in red. 0600a Codex Bezæ Luke vi. 5 (Greek text) ΕΙΠΕ ΔΕ Ο ΙΗ ΠΡΟ ΑΥΤΟΥ. (Latin text) dı xı t autemıh s ad eos. 1000c Ælfric Homilies II. 214 Iesus is Ebreisc nama, þæt is on Leden ‘Saluator’, and on Englisc ‘Hælend’. 1000c West Saxon Gospels: Matt. (Corpus Cambr.) i. 1 Her is on cneorisse-boc hælendes cristes dauides suna. 1000c West Saxon Gospels: Matt. (Corpus Cambr.) i. 16 Se hælend þe is genemned crist. 1175a Cott. Hom. 235 Ures hlafordes to-cyme þes helendes iesu [ed. ihesu] cristes. 1175c Lamb. Hom. 3 Þe helend nehlechede to-ward ierusalem. 1200?c Ormulum (Burchfield transcript) l. 3355 Ȝuw iss borenn nu to daȝȝ Hælennde off ȝure sinness. 1225?c (▸?a1200) Ancrene Riwle (Cleo. C.vi) (1972) 89 Þe luuewurðe lauerd. þe healende of heouene. 1240a Wohunge in Cott. Hom. 269 Ihu, swete. 1240c Ureisun in Lamb. Hom. 200 Iesu soð god, soð mon, & soð meidenes bern. 1240c Ureisun in Lamb. Hom. 202 Þet mei iesu þis baldeliche seggen to þe. 1250c Kent. Serm. (Laud 471, lf. 128 b) , Cvm natus esset iħc in betleem iude. 1275c (▸?a1200) Laȝamon Brut (Calig.) (1963) l. 4561 A child.. þat scolde beon ihaten Hælend [c1300 Otho Helare]. 1377 Langland Piers Plowman B. iii. 154 Bi iħus with here ieweles ȝowre iustices she shendeth. 1377 Langland Piers Plowman B. Prol. 165 Were þere a belle on here beiȝ, bi Iesu [ed. Ihesu], as me thynketh, Men myȝte wite where þei went, and awei renne. 1377 Langland Piers Plowman B. xvi. 144 Iudas iangeled þere-aȝein ac Ihūs hym tolde. 1500a (▸?a1400) Sir Torrent of Portyngale (1887) l. 1447 For Iesu love that died on Rood. 1526 Bible (Tyndale) Luke viii. f. lxxxviij, What have I to do wyth the Iesus the sonne off the moost hyest? 1526 Bible (Tyndale) Luke xvii. f. ciiijv, Iesu master, have mercy on vs.
1526 Bible (Tyndale) Luke xviii. f. cvij, Iesus the sonne of David, have mercy on me. 1526 Bible (Tyndale) Matt. i. f. j, The boke off the generacion off Ihesus christ. 1526 Bible (Tyndale) Matt. viii. f. xv, O Iesu the sonne off God. [1534 Iesu, so Cov., Gr. ; Gen., Bps'., etc. 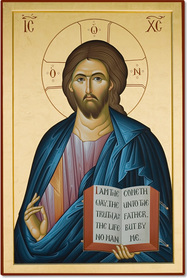 Iesus] Christ be with you all. 1526 Bible (Tyndale) Rom. xv. 17 Wheroff I maye reioyse in Christ Iesu. [1534 Iesus: so all later versions] Christes sake. 1540 in W. L. Nash Churchwardens' Acct. Bk. St. Giles, Reading (1851) 59 Paid to the Wardens of Ihc Masse towardes the prestes wages xiijs iijd. 1544 R. Tracy Supplycacion to Kynge Henry VIII sig. Dvj, Through thy Sone Ihesus Christe. 1633 G. Herbert Temple: Sacred Poems 105 Jesu is in my heart, his sacred name Is deeply carved there. 1678 Trial of Coleman 27 L. Chief Just., What Inscription was upon the Seal? Mr. Oates. Ι.Η.Σ. with a Cross, in English it had the Characters of I.H.S. 1740 C. Wesley in J. Wesley & C. Welsey Hymns & Sacred Poems II. i. 67 Jesu, Lover of my Soul, Let me to thy bosom fly. 1779 W. Cowper in J. Newton & W. Cowper Olney Hymns iii. xlix. 369 Lord my soul with pleasure springs, When Jesus' name I hear. Around the year 1000, it is mistakenly stated that "IESUS" is the Hebrew (Ebreisc) word for "Savior". This is the only discrepancy from what was stated in Part 1. With the full philological authority of the Oxford English Dictionary behind our research, we can confidently declare that the word "Jesus" dates from 1779. Before this time, the "I" was pronounced as a "Y" as in the Hebrew, Greek and Latin. Under the heading "J" from the OED: "But though the differentiation of I and J, in form and value, was thus completed before 1640, the feeling that they were... merely forms of the same letter continued for many generations..." Therefore, it is only after 1640 that English writers distinguished between "J" and "I" and it took several generations for the "J" to be pronounced as we do today. The only discrepancy from the OED has been mentioned and the article is internally consistent. However, when we look to the Greek Church and their abbreviation, more accurately described as a contraction, of "Jesus", we find they do not use the first three letters, but the first and last letters. This use of the first and last letters is also followed when abbreviating "Christ"(XC). The use of first and last letters is not limited to Jesus. 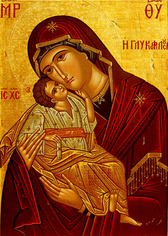 The icon below is of the Theotokos (Greek: Μήτηρ του Θεού, English: Mother of God) and the contraction is shown in the top right and top left corners of the icon. "However, those reading or hearing the English phrase Mother of God as a translation of a Greek text cannot — unless they know the Greek text in question, or obtain additional information — know whether the phrase is a literal translation of Μήτηρ Θεού or an imprecise rendering of Θεοτόκος or one its Latin equivalents or equivalents in other languages." As evidenced by contractions found on Orthodox icons, we must wonder where and when the English scribes decided to use an abbreviation that would not be found in an actual Greek manuscript that originated in eastern Europe. We are expected to believe that when the scribes, who are either unfamiliar with the Greek language or the convention to contract and not abbreviate, found the contraction "IC", the scribe proceeded to abbreviate it as "IHS". Later editors who must also be ignorant of the Greek language expanded this to "IHESUS". We infer that the editors thought the "H" was somehow integral to the name or they would have translated it using the Latin spelling of "IESUS". Gentle reader, we are left in an unenviable and uncomfortable position. On one hand, we readily acknowledge the exceptional scholarship of the Oxford English Dictionary, yet, on the other hand, we must reluctantly admit that discrepancies exist when we look beyond English shores. We conclude the scribe had read "Ἰησοῦς" with the letter eta,η, capital letter eta (H) and inexplically contracted it into Latin letters as "IHS".